Fiberglass pools are becoming more and more popular...but they're still a relatively new addition to the pool scene, compared to vinyl liner and concrete pools. What do you actually know about them? If the answer is "not much," fret not. This is a judgment-free zone, and we've got you covered. We've collected the fiberglass pool FAQs, and succinct answers for all of them. Plus links if you're interested in more in-depth info. How much does an inground fiberglass pool cost? How is a fiberglass pool made? Do fiberglass pools work in cold climates? 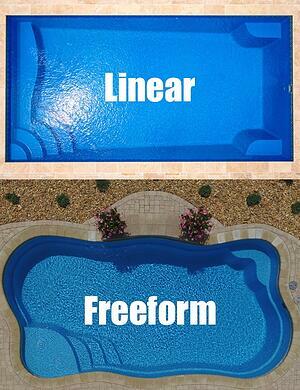 What shapes do fiberglass pools come in? What sizes do fiberglass pools come in? Can you customize the shape of a fiberglass pool? What's the warranty on a fiberglass pool? Are fiberglass pools easier to maintain than vinyl liner or concrete pools? 1. How much does an inground fiberglass pool cost? 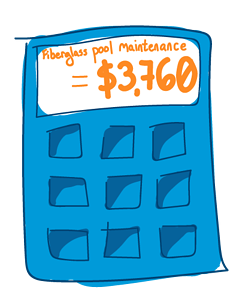 On average, most fiberglass pool projects cost $45,000–$85,000 in the initial purchase. Extra features and upgrades will, of course, increase that price further. Once the pool is ready for use, you don’t need to purchase many chemicals or run much equipment to kill algae. The long-term pool maintenance will only cost about $3,760 for every 10-year period. 2. How is a fiberglass pool made? Spray the gelcoat onto the mold. Apply chopped fiberglass with 100% vinyl ester resin. Apply chopped fiberglass with polyester resin. Apply woven roving at stress points for additional strength. Apply structural honeycomb materials to support the side walls. Apply the final layer of fiberglass with polyester resin. Remove the pool shell from the mold. Quality check the pool shell. If you're a visual/auditory learner, check out our 8-part video series on How Fiberglass Pools Are Made. 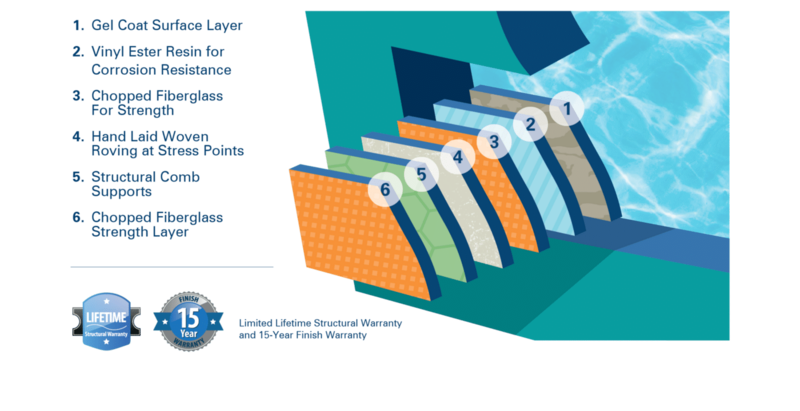 The River Pools Way: Advanced Manufacturing methodology ensures that you get the strongest, most durable fiberglass pool possible. 3. How is a fiberglass pool installed? Our advanced installation techniques in The River Pools Way combine ground-breaking best practices to prevent long-term issues like leaks, separation, settling, and bulges. Learn more: How Are Fiberglass Pools Installed? 4. How long does it take to install a fiberglass pool? It only takes about 3–6 weeks to install a fiberglass pool. This includes the pool itself, the patio, and landscaping. You can actually swim in your pool by the end of day 2! Learn more: How Long Does it Take to Install a Fiberglass Pool? 5. Do fiberglass pools work in cold climates? You may have heard a myth that fiberglass pools crack in cold weather. This is just bananas (B-A-N-A-N-A-S). Frozen water doesn't crack an ice cube tray, right? It expands a little bit upward, not outward. Same goes for a pool. Note: for any type of pool in a cold climate, you should winterize your pipes (blow out the water and plug them) for the off-season. This prevents the pipes from freezing and possibly cracking. 6. What shapes do fiberglass pools come in? The shape and size of fiberglass pools can’t be customized the way concrete or vinyl liner pools can because they’re built from existing molds. They also have to be 16 x 40 ft or smaller, since they travel by highway to get to your house. Still, you have tons of options! Every fiberglass pool manufacturer produces different designs. You can check out River Pools' designs for yourself. Learn more: What Are the Best Fiberglass Pool Shapes? 7. What sizes do fiberglass pools come in? Fiberglass pools can be as small as 10x20. These are great for small yards. On the whole, fiberglass pools go up to 40 ft. by 16 ft., but not much more than that. Learn more: What Are the Biggest and Smallest Sizes for Fiberglass Pools? 8. Can you customize the shape of a fiberglass pool? Fiberglass pools are constructed from a mold in a factory, so you have fewer options to customize the size and shape. You're limited to prefabricated shapes. However, let no one tell you it's not a custom pool. 9. Do fiberglass pools float? A properly installed and maintained fiberglass pool will never float or pop up. First, your pool should have a sump system. At River Pools, we install a sump pipe so you can monitor and remove groundwater. We also lock the pool and patio into place with a River Rod and extra-thick concrete bond beam. Second, your pool should always be filled with water. The weight of the water helps prevent the pool from both popping up and floating. Learn more: How Does Hydrostatic Pressure in an Inground Pool Work? 10. How long do fiberglass pools last? The structure of the pool will last as long as the home—certainly 50+ years. The gelcoat surface will last decades as well, if properly manufactured and maintained. Learn more: How Long Do Fiberglass Pools Last? 11. Do fiberglass pools fade? All pools will lighten to some degree. Will the gelcoat surface lighten over time? Yes, but gradually and evenly. If properly manufactured and maintained, the gelcoat surface of a fiberglass pool is the most durable pool coating available, both in terms of appearance and life expectancy. If you were to compare a new color sample to a 10-year-old pool, you might notice some difference, but otherwise you'd likely not be able to tell. Premature or uneven fading of the gelcoat surface is almost always because of improper water chemistry. Learn more: Will My Inground Pool Fade? 12. What's the warranty on a fiberglass pool? The structural warranty says how long the manufacturer guarantees the pool will hold water. Usually it lasts “for the life of the pool,” i.e., as long as the pool is owned and in normal use. The surface warranty needs to specifically cover osmotic blisters on the surface of the pool. What’s the duration of the warranty? Learn more: Which Type of Pool Has the Best Warranty? 13. Are fiberglass pools easier to maintain than vinyl liner or concrete pools? Algae isn't a problem because the gelcoat doesn't have the pores and cavities of concrete pool plaster—it's smooth and algae-resistant. There's nowhere for the algae to live. If manufactured well and maintained properly, a fiberglass pool’s gelcoat should never need to be refinished. Learn more: What Type of Pool Needs the Least Maintenance? 14. What makes River Pools different? For the year 2018, Pool and Spa News ranked us #32 among all pool builders in America, #3 in customer service, and in the top 10 for web presence and community service. We didn't do that by following the crowd. Our manufacturing and installation techniques set us apart, because anything less than the best just doesn't cut it for us. Our advanced manufacturing methodology combines the highest-quality materials and manufacturing best-practices to produce the best fiberglass pool shell possible. We manufacture every mold true and level, reinforce them with steel, and maintain them well over time. This ensures that every pool made from that mold is exactly the same shape. Many companies say they use vinyl ester resin for their pools, but beware—any percent of vinyl ester mixed with polyester resin can be called "vinyl ester resin." You need minimum 50% vinyl ester resin to prevent blisters. Unlike most manufacturers, we use a layer of 100% vinyl ester resin to prevent osmotic blisters from forming in the gelcoat. We also use woven fiberglass roving and honeycomb structural materials to support your pool shell in the areas that experience the most stress, like the walls and steps. After we remove the pool shell from the mold, we inspect it twice to make sure the gelcoat meets our standards. Then we weigh the pool. If it matches the ideal weight, we know that we used the proper amount of material. 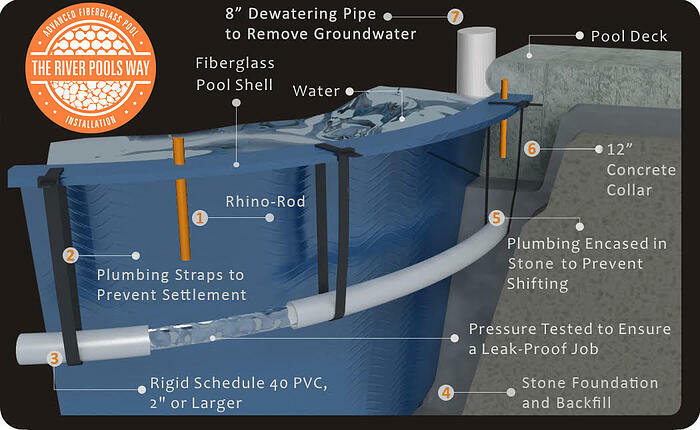 The River Pools Way combines installation best-practices to eliminate the most common problems with fiberglass pools. We use clean, crushed stone for backfill. Unlike sand (the industry standard), it doesn't move or change its properties when wet. The plumbing straps provide even more support to the plumbing. Nice! We use a River Rod and a concrete collar to lock the pool in place. This prevents your pool from moving and separating from your patio. We use only rigid PVC for the plumbing because flexible PVC, while easier to use, isn't rated for underground use. Termites and rodents can actually chew through the flexible material. No thanks. The sump pipe we install gives you access to the bottom of the hole where your pool sits. More important, it gives you access to the groundwater that collects there. You need to be able to remove that groundwater if a professional needs to drain your pool. We've developed these unique methods because we want to provide the best value possible to our customers—above and beyond the industry standard. We manufacture and install fiberglass pools in Virginia and southern Maryland. Our dealers across the US install our pools as well. If you're ready to take the next step in your pool journey, get in touch with us! Next: Should I Get a Fiberglass Pool? Editor's note: This blog article was updated on March 12, 2019.